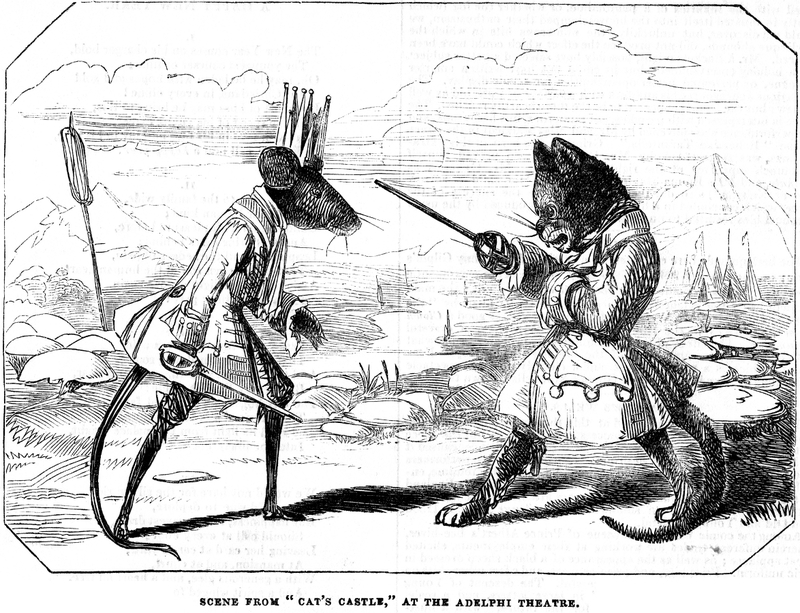 Cat's Castle; or, Harlequin and the King of the Rats, author William B. Buckstone, composer Alfred L. Mellon. Whiskers was Christopher J. Smith and Killcat, John Sanders (later they become Clown and Pantaloon). The Pantomime at this house is from the pen of Mr. Buckstone, and is called "Cat's Castle; or, Harlequin and the King of the Rats," and purports to be "founded upon a categorical and doggrel poem, written by a Laureate, who invoked the Mews of the Middle Ages." We can well remember an old lottery print upon the same subject, which was published by Messrs. Bowles and Carver, who formerly kept such an endless repository of entertaining pictures in St. Paul's Churchyard. The whole of the opening of this piece is taken up by the warlike preparations and battles of the contending parties. We find Whiskers, King of the Rats (Mr. C. J. Smith), and the Princess Molrow (Miss Lonsdale); there is also Prince Tortoiseshell Torn (Mr. T. Ireland), and Kill Cat, Generalissimo of the Rat Army (Mr. Sanders); while amongst the officers are such names, in the feline army, as Marshal Pantiler, Colonel Purwell, and Major Fitz-spit. The siege and blowing up of Cat's Castle is the signal for the appearance of the Fairy Honeysuckle, in a radiant star, who transforms Tortoiseshell and Molrow to Harlequin and Columbine, and Whiskers and Kill Cat to Clown and Pantaloon. A number of allusions to passing events are introduced in the Pantomime, as well as the topics of the past year: Hungerford Suspension Bridge and the Invisible Shell; the Running Rein Fraud and the Insolvent Debtors' Court; the Washhouses for the Million; General Tom Thumb--all leading up to a succession of dioramic tableaux associated with events retrospective of the year 1844, painted by Mr. Charles Marshall. The business after the transformations proved somewhat dull, and even making allowance for a first representation, the machinery was very much at fault. The tricks were old, and scarcely brought a laugh; and the audience appeared as dull as if witnessing a tragedy. The feats of the Infant Lauri Family drew down considerable applause, and were really clever; one or two things here and there were pretty good, as the "Box of American stores," changing to Tom Thumb's carriage, from which a capital likeness of the "General" alighted, and bowed to the audience. There was, also, a cleverly painted scene of Dioramic Tableaux of the most attractive events of the past year.